Before you begin the first chapter, I would like to clarify a few points. For the purpose of this book, the term “happiness” is defined as “contentment, inner peace, and inner strength”. My intention is that this book can help you to usually feel contentment (a strong, peaceful happiness) as your base, underlying feeling. By maintaining a constant base of contentment, your level of happiness will grow. This book is about how to restore your inner strength, inner peace and contentment. This book does not mean to say that you should always feel happy. This book is about noticing when you are unhappy, and then being able to find a way back to inner peace. So the main goal of this book is to help you to feel content for most of your time in this world. I believe that if you can train yourself to feel content and inner peace for most of your life, then your ability to do this will make you feel good about yourself. Some may ask, “How can Muslims be happy when there is so much injustice in the world and when many Muslims are suffering?” I believe that we as Muslims need to find ways to alleviate the problems we face. I believe that the first step to alleviating our problems is to become more peaceful within. When we feel peaceful within, we are better prepared to resolve our problems. I am not suggesting that we ignore the injustices happening in the world. The P stands for Pray, be Patient, Problem-Solve and be Positive. The A stands for Appreciate and Accept. The C stands for Cope and be Calm. The E stands for Exercise. The S stands for Self-Strength, Self-Awareness, and Self-Study. “PACES” literally mean “single steps”. This is also important, because we must take single steps in order to reach any goal—such as happiness. Even a single step will bring you closer to being more content and peaceful. Another relevant meaning of “paces” is to walk back and forth. 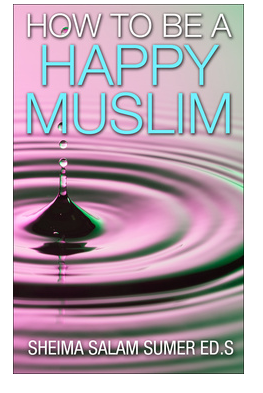 This is important because you must realize that your journey to becoming a Happy Muslim will go back and forth. You will feel like you have improved yourself (progressed), and then you will feel like you have regressed/ gone backward. This is totally normal. Going back and forth is part of the journey to becoming the best YOU possible. The phrase “pace yourself” is also important. “Pace yourself” means to slow down and to accomplish your goals in steps. HAPPINESS HINT: YOU WILL SUCCUMB TO NEGATIVE EMOTIONS SOMETIMES. IT’S PART OF THE PROCESS OF LEARNING TO BE A HAPPY MUSLIM. BE PATIENT WITH YOURSELF. Here is a more detailed description of “P.A.C.E.S.”—the main points I hope you will take from this book. P for Pray, Be Patient, Problem-Solve, and be Positive: Pray to Allah (swt) about any problem you are facing. Be patient when life is not perfect. Be patient with yourself when you are in a bad mood or you’ve made a mistake. Be patient with your negative feelings, accept that they are there, and patiently find ways to move past them, at your own pace. Focus on finding solutions to your problems instead of just focusing on your problems. Train yourself to focus on the positive in every situation. A for Appreciate and Accept: Focus on what you appreciate in life and in others. Appreciate as much as possible. Express this appreciation to Allah (swt) and to people you appreciate. When you are feeling down, shift your energy/focus to what you genuinely appreciate in your life. Accept that life is challenging and that it is normal to face hardships and to feel down sometimes. To accept does not mean to approve, it means to understand that we are only human, we are not perfect, and that this world is not always easy. C for Cope and be Calm: Find ways to cope with stress. Find ways that help you to remain calm. The calm that I am referring to is a strong sense of inner peace. E for Exercise: Exercise is an excellent way to cope with stress. Exercise is not an option but a must in order to have good health. Daily exercise is best. S for Self-Strength, Self-Awareness and Self-Study: Trust yourself. Value yourself. Know yourself. You don’t have to be perfect and you don’t have to know everything. But you have positive qualities and strengths. Use them! Develop your self-confidence by learning from your life’s experiences—both the good and the bad. Self-awareness means that you remember yourself in all situations. Self-awareness means that you are aware of your thoughts, feelings, and actions. This is extremely important, because many counseling experts believe that your thoughts cause your feelings, and your feelings cause your actions. Be aware of your inner feelings and learn to control them. If you can learn to control your feelings, then this skill will lead to better actions that lead to a happier life. Also, learn to put your happiness first (without contradicting the teachings of Islam of course). Putting your happiness first means that you make decisions that promote your happiness, rather than living life passively. Don’t “lose yourself” in the outer world, in other people’s problems, in things that bother you. If you have a negative feeling, accept that feeling, be patient with yourself, and find ways to get over that hurdle. Sometimes if you just say out loud, “I feel angry (sad, hurt, etc. ),” that can take the power of out of your negative feeling, and then you can resolve the situation more effectively. Self-study means you need to observe yourself and discover methods that bring you happiness. Observe what foods make you feel happy, what habits promote your happiness, etc. Understand that you know yourself better than other people know you, therefore, other people may not understand your choices, because they are not you! Do what is right for you, as long as it is not displeasing to Allah (swt). My mother also suggested that this book should explain how to assertively communicate one’s needs/thoughts with others. It is not my intention for this book to encourage a passive approach to life. Although this book does not go into details about assertive communication , this book encourages you to find your own solutions to problems and think about what you want rather than what you fear. If you think that assertive communication could solve a particular problem you have, then I encourage this. My advice as a trained counselor is to first bring your emotions to a state of inner peace and strength before attempting to solve issues with other people. I hope that readers will reflect on how the ideas in this book relate to them personally. Even though this book is written for Muslims, non-Muslims are also welcome to benefit from the thoughts and ideas proposed in this book.